We’d love your help. Let us know what’s wrong with this preview of The Choose Yourself Guide To Wealth by James Altucher. We are living in an epic period of change, danger and opportunity. The economy is crashing and booming every few years. People a This is a bold book by James Altucher because he not only gives you a new map for the new financial landscape, but he also has skin in the game. To ask other readers questions about The Choose Yourself Guide To Wealth, please sign up. Here's the thing about this book: it's a poorly written rant... but it has some gems in it. Now, you can decide on your own whether you want to take life/business advice from someone who has fluctuated between millionaire and broke (multiple times! ), but some of his points certainly ring true. Altucher has some interesting things to say about sales, HR, fundraising, and investing. There's also an interesting section on "myths that ruin peoples' lives". Lucky for you, I've extracted all the pearl Here's the thing about this book: it's a poorly written rant... but it has some gems in it. Now, you can decide on your own whether you want to take life/business advice from someone who has fluctuated between millionaire and broke (multiple times! ), but some of his points certainly ring true. Altucher has some interesting things to say about sales, HR, fundraising, and investing. There's also an interesting section on "myths that ruin peoples' lives". Lucky for you, I've extracted all the pearls so you don't have to dig through the... not pearls. My only three goals in life are To be happy. To eradicate unhappiness in my life. For every day to be as smooth as possible. No hassles. Remember this phrase: “Get Paid, Get Laid, Lose Weight”—because those are the three things people will pay for. Only free time, imagination, creativity, and an ability to disappear will help you deliver value that nobody ever delivered before in the history of humankind. States of panic are special and have to be revered. At any given point I have about ten to twenty books on my “to go” list—books that I can just pop into and continue reading. Every day I read at least 10 percent of a nonfiction book that gives me tons of new ideas and similar portions of an inspirational book, a fiction book of high-quality writing, and maybe a book on games (lately I’ve been solving chess puzzles). And then I start writing. Nobody is going to buy from someone they hate. The buyer has to like you and want to be your friend. People pay for friendship. This sounds sort of whorish and it is. What you offer is not just your product. Your offering is product, services, your employees, your experiences, your ideas, your other customers, and even (as mentioned above) your competitors. So sell them all. When you are good at what you do, the product or service you offer is just the way people build the first link to you. It’s the top of a huge pyramid. When you get in the door, do not sell your product. People make a decision on your product in five seconds. Sell the dream. Build up images of the dream. Give a taste of what the dream is like. Let it linger. Let it weave itself. Let the imagination of the buyer take hold and run with it. The dream has up to infinity in value. But then, you might ask, do I risk under-delivering? Answer: Yes. Don’t do that. Be as good as the dream. Being a leader doesn’t mean you are the guy who runs things. Being a leader doesn’t mean you created something or you did something great in the past or some other person has given you any kind of authority. Being a leader happens right now, today. It’s something you can do without money, without authority, and without anybody. Most important by far is that you be able to care about others’ success more than your own. Everyone around you needs to ultimately become better than you. That’s how you lead. The light is in front of you and you take them to the light and then go back. If all the people around you achieve more than you, then life will be good. I’ve seen this happen repeatedly. It doesn’t matter if they are employees, investors, friends, or spouses. If you just focus on this one principle in all of your actions, then you are a leader. One hundred percent of the time there is a good reason and a real reason for everything. Here’s the operating theory: you don’t need to spend 10,000 hours at anything to be the best. You just need to be pretty good at something (spend a couple of hundred hours) and then you need to know how to give a good talk in public. You will stand out, because so few people want to talk in public. Let’s say someone is buying your company. It may seem like all they are doing is buying the assets of your company. But they are also buying your company’s “negative imprint.” In other words, they are buying the fact that nobody else can buy your company.” They can say, “Well, we don’t care about that.” Then fine. See if it’s true. Offer your services to other companies. If you can’t walk away from a negotiation, then you aren’t negotiating. You’re just working out the terms of your slavery. You can’t get good at something if you are working twenty hours a day. In fact, something is very wrong in your life if that is how much you are working at one thing. The typical answer is “I study four hours a day.” Former world chess champion Anatoly Karpov said the maximum he would study chess is three hours a day. Then, when he wasn’t in tournaments, he’d spend the rest of the day exercising, studying languages, and doing other things to balance out his life.. But when it comes to mastery, there are always big failures. Never let one company decide your fate. 1000s of businesses have been lost because of this one mistake. The key is to anticipate what the people you’re aiming to serve might want, show them how it will cost them nothing but they will get huge benefit from it, and then just simply do it. Make it as easy as possible for the other side to say yes before you ask them. If you want someone to say yes, show them exactly what “yes” looks like and show them that it is already made. Should I pay taxes? No. You should always reinvest your money and operate at a loss. Should I pay dividends? See above. What should the CEO salary be? No more than two times that of your lowest employee if you are not profitable. This even assumes you are funded. If you are not funded your salary should be zero until your revenues can pay your salary last. The CEO salary is the last expense paid in every business. Should I hire a head of sales? No. The founder is the head of sales until at least $10 million in sales. Thiel’s four attributes for a good business are monopoly, scalability, network effect, and brand. And the good news is this: if you can become aware of the myths that people hold and the way they manipulate societies and cultures, you can write your own rules and create abundance for yourself. * Owning a home will give you “roots,” and is far better than “flushing money down the toilet with rent.” Most people don’t realize that owning a home has all the attributes of the worst investment possible: it’s highly illiquid, there’s a high leverage, it includes most of your net worth, and provides you with an average return of only 0.2 percent over the past year. And this doesn’t count all your maintenance costs. I’d rather rent, and either invest the extra money in myself and my own ideas. * Having kids is the purpose of life, and having a purpose in life is important to having a fulfilling life. I like how Scott Adams from Dilbert fame put it: live according to Systems and not Goals. Nobody has a single purpose in life. We are often put into our life circumstances and have to figure out how to do the best. In this book and in Choose Yourself! I try to give a system to develop great ideas and build abundance. * Humans are smarter now than they were 40,000 years ago. Sometimes wars can be justified. Tip #1: Never invest big chunks of your money. A big chunk is more than 2 percent of your money. So if you have $10,000, don’t buy a TV that costs more than two hundred dollars. Don’t buy an iPad. Don’t buy a car. Definitely don’t buy a car. Just be happy with the money in the bank. But if you have even more money here’s what it means: Don’t go to college. Don’t own a home. Don’t invest more than 2 percent in any private company. Don’t invest more than 2 percent in any stock or any bunch of stocks in the same sector (don’t put more than 10 percent overall in stocks). Don’t invest in your own company. Tip #2. The whole point. Stop paying your debt. Let me clarify. If you borrowed from a friend, pay your friend back. Be a good person. But all other debt is a contract, and there are several situations where you can stop paying debt. “Ethics” is a government-made term to try and induce you to pay back your debt when you don’t have to. But you can ignore that. Well, Who Makes Money In The Market Then? Three types of people: People who hold stocks FOREVER. Think: Warren Buffett (has never sold a share of Berkshire Hathaway since 1967) or Bill Gates (he sells shares but for 20 years basically held onto his MSFT stock). People who hold stocks for a millionth of a second (see Michael Lewis’s book “Flash Boys” which I highly recommend.) This is borderline illegal and I don’t recommend it. People who cheat. Reading is the best return on investment. You have to live your entire life in order to know one life. But with reading you can know 1000s of people’s lives for almost no cost. What a great return! 2. Remember that cash is king. Having a lot of cash leads to a stress free life. Invest as little as possible. 7. The S&P 500 index is proven to be the best hedge against inflation except for hyperinflation. 8. Investing in you is the best hedge against hyperinflation. If you have a good business, you collect all the money. 9. Never invest in anyone else’s ideas of investing: mutual funds, ETFs, bank advisors, hedge funds, venture capital funds. 10. Never invest because of tax reasons: 401(k)s, IRAs, Roth IRAs, 529 Plans, insurance annuities, etc. These are taxes against the middle class where the money goes straight from your employer into the hands of the rich. I choose public over private school. I moved about eighty miles out of NYC so I could send my kids to a good public school and pull them out of the BS private school they are in. I’m in favor of “unschooling”—no school education at all. I trust that kids want to learn and if they don’t, then school is even a worse way to get them to learn. School is intended as babysitting so I don’t let a BS private school charge college-like prices to babysit my kids. Inheritance. Nobody should inherit more than the minimal they need monthly to get by but still have motivation to go out and make something for themselves. I set up trusts for my kids, not just to guarantee that they’ll never have to lie on the floor scared (like I have) but that their kids and their grandkids will hopefully have money to spend. Uncertainty is your best friend. A hundred percent of opportunities in life are created because people are uncertain about almost everything in their lives. We are constantly trying to close the enormous gap between the things we are certain about and the things we are uncertain about, and almost every invention, product, Internet service, book, whatever has been created to help us close that gap. “Help me” is the most powerful, and most forgotten, prayer. Laughter is essential. The only way to survive is to laugh. There’s that saying: “Man plans, God laughs.” Well, you might as well be on the same side as God. I only care about you. And you’re effin’ crazy if you thought the world was going to line up any other way than the way it lined up. Tough on you. I know that when I feel like, “ugh, this situation is insane,” the first place I need to look is at me. I am insane. James knows how to market, and he made me buy his book even before I started with the "Chose yourself" book. When I found out "Choose yourself" is not really the thing I was hoped for my expectations for this book went down. But seriously... it was a huge disappointment. He repeated a lot of content from "Choose yourself" and added some examples. If you read his blog then there is nothing new for you. It's always the same things he mentions: college is stupid, the world changes, and you need to James knows how to market, and he made me buy his book even before I started with the "Chose yourself" book. When I found out "Choose yourself" is not really the thing I was hoped for my expectations for this book went down. But seriously... it was a huge disappointment. He repeated a lot of content from "Choose yourself" and added some examples. If you read his blog then there is nothing new for you. It's always the same things he mentions: college is stupid, the world changes, and you need to take your life in your own hands. Yeah, got it. I found it very funny when he complains that some books should be chapters. I thought the same of some of his writing too. Unfortunately James is one of the authors of whom I feel they never write new things when they found something which works. 2.5 stars - James Altucher always fascinates me. He has had a ton of financial success and has interviewed top performers from every imaginable field on his podcast. He shares what he’s learned from his guests’ experiences as well as his own in the hopes that it helps someone, and his worldview is so different from the norm that it makes you question whether his approaches are crazy, brilliant, or both. The content in this book is pretty fun and thought-provoking at times and seemingly hacky at 2.5 stars - James Altucher always fascinates me. He has had a ton of financial success and has interviewed top performers from every imaginable field on his podcast. He shares what he’s learned from his guests’ experiences as well as his own in the hopes that it helps someone, and his worldview is so different from the norm that it makes you question whether his approaches are crazy, brilliant, or both. The content in this book is pretty fun and thought-provoking at times and seemingly hacky at others. There are too many typos and stream-of-consciousness tangents for me to believe that this went through an editor even once, and that makes me feel like this book is nothing more than a money grab. After reading some other comments on this book, I've got to add my brief take on it. I love James Altucher, but as someone else mentioned you probably either love him (and his writing) or you hate him. This book much like the initial Choose Yourself book is one part motivational, one part timely wisdom, and one part crazy... I mean entertaining :) And that's why I love it. James takes on a serious topic without taking himself or the topic too seriously, which I think is what I love about all his wr After reading some other comments on this book, I've got to add my brief take on it. James takes on a serious topic without taking himself or the topic too seriously, which I think is what I love about all his writing. Will it be everyone's favorite style? No, but that's the point - it's meant to provoke thought and encourage a new outlook - and that I think James does very well for those that fit his audience. I'd recommend Choose Yourself or his blog first before you take on this one as it's a bit longer. But for those wondering if it's worth reading? It is. I think you'll either be inspired or frustrated but either way you'll be challenged on the important topic of wealth - after all, maybe true wealth isn't really what you always thought it was. What I've learned from choosing myself is that how I spend and save my time is the most important currency to me. Having control over that is what makes me wealthy. This book is about that type of wealth, and how to better create and invest the other type of wealth too. All this in James' own quirky style that I love flowing back and forth between self-deprecating and humble-bragging (as someone else mentioned). It's a good thing, most people writing books pretend they have it all together. James comes clean, while showing he still can add value. I was first exposed to James Altucher by Tim Ferriss in "Tools for Titans" and was encouraged to exercise my "Idea Muscle." Since reading that chapter, I have been writing down at least 10 ideas per day; I'm now on week five and it has been an enlightening experience. Most of my ideas are bad and I will never act on them. However, Altucher would say, "The ideas themselves don't matter. Exercising the idea muscle is what matters most." 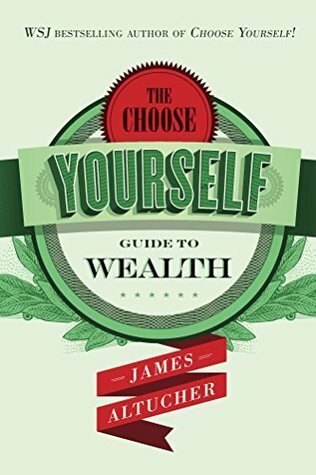 Regarding "The Choose Yourself Guide to Wealth," Altucher is I was first exposed to James Altucher by Tim Ferriss in "Tools for Titans" and was encouraged to exercise my "Idea Muscle." Since reading that chapter, I have been writing down at least 10 ideas per day; I'm now on week five and it has been an enlightening experience. Most of my ideas are bad and I will never act on them. However, Altucher would say, "The ideas themselves don't matter. Exercising the idea muscle is what matters most." Regarding "The Choose Yourself Guide to Wealth," Altucher is all over the place. First, the negatives. In a way, it's kind of refreshing to read his thoughts because it gives me hope that I'm not all that crazy, especially compared to him! He is definitely off his rocker (my wife would say he's "bat-$hit crazy) and I don't agree with everything he recommends. The book must not have been proofread or professionally copy-edited because there are misspellings, format mistakes and grammatical errors throughout. Now for the positives. Despite my disagreement with Altucher on many of his recommendations, mostly regarding investments, the proof is in the pudding. In other words, the guy is a multi-millionaire and comes up with brilliant ideas. I've never been a millionaire, I've never written a book on Warren Buffett and I've never managed a multi-million dollar hedge fund before. Altucher has done all these things and more. While I would not go so far as to call him an expert, he likely would not claim this either. His style is self-effacing, humorous and passionate. He comes across as sincerely wanting to help others and often uses himself as an example of what NOT to do. Additionally, the spelling and grammatical errors mentioned above do not dramatically detract from the book's overall message of hope and encouragement. Overall. You need to know what you're getting into before you read this book. Expect to be entertained more than to become enlightened. There are some practical applications to be found, but you need to dig for them. When you find those golden nuggets, they still might not be appropriate for you. I read two back to back books of James Altucher. The one I am writing the review and Choose Yourself: Be Happy, Make Millions, Live the Dream. Reading Choose Yourself impressed me a lot and made me read this one. I must say James is one of the most practical authors I have ever came across. This books highlights clear steps and methodologies to de-clutter your mind from various belief that are followed from ages. At some stages in the book it looks a dragging one, but otherwise it is a gem to rea I read two back to back books of James Altucher. The one I am writing the review and Choose Yourself: Be Happy, Make Millions, Live the Dream. Reading Choose Yourself impressed me a lot and made me read this one. I must say James is one of the most practical authors I have ever came across. This books highlights clear steps and methodologies to de-clutter your mind from various belief that are followed from ages. At some stages in the book it looks a dragging one, but otherwise it is a gem to read. If someone follows the advise shared in this book it will definitely help him/her to improve as a person. Some of the cases like Eminem story is wonderfully presented and can help entrepreneurs/employees to place their best case in front of their customer/bosses. I like Altucher's ideas and believe that many I've never tried in my life are at least worth giving serious consideration. He talks a lot about becoming an Idea Machine which could have considerable benefits. Especially for younger people, this book is a good primer for surviving and thriving in today's environment. What is detracting, for me, is Altuchers unrestrained enthusiasm for his ideas, his appearance and the fact that his book contains numerous typographical and grammatical errors. Of co I like Altucher's ideas and believe that many I've never tried in my life are at least worth giving serious consideration. He talks a lot about becoming an Idea Machine which could have considerable benefits. Especially for younger people, this book is a good primer for surviving and thriving in today's environment. In this book he reviews the concepts from Choose Yourself, and adds more information regarding business and finances. There is a wealth of information that can be put to use. This book is scatterbrained, disjointed, and painful to read. There are a few nuggets of good information but unfortunately they are surrounded by rants. The author flits from one topic to the next with very little cohesion. I can't say I'm really surprised, since he mentions selling businesses within months of creating them and being broke multiple times. For those who are steadfast and considered in their lives, this book provides little value. It worked perfectly into my new mindset and it made me realise that it's not a bad thing that I'm having - as I recently called it - "too many ideas". The chapter on Investing seemed a little too obviously frankensteined together from blog posts. But that's easily forgiven. Highly recommended and I'll definitely go for other books of the author in the future! Iife of extreme up and downs that most of us will never know, but we can learn from these experiences. A lot of simple advice that you can change your life for the better. The book has lots of useful ideas and strategies and James has a quirky way of getting his points across. He also makes it easy and entertaining to get through what some could view as very dry or uninteresting subject material. I read it on a Kindle but ordered a physical copy to make notes and use it as a resource. It was inspiring in a way that made me believe that despite only an undergrad degree I can make my dreams come true. May be a bit naive though in how it portrays ease but will be trying. Frankly, I didn’t get it. I bought the book off one of Altucher’s Instagram ads for the cost of shipping so thankfully I’m not out much money. I originally thought it was a wealth-building or -management guide but I was wrong (I think—like I said, I didn’t really get the point). I like the author, he has an interesting podcast and does crazy experiments where he sold everything and lived out of AirBnB's and mooched off friends for a year. The book was a little lacking. Not enough detail for a business book. Has great ideas but not a lot of how to in my opinion. Lived the idea machine.. lack of blue collar advice. I love the idea machine premise, but would have loved a little shout out to blue collar workers and some advice to general population of shift work. Great ideas, and will out these into practice. So much insightful advice in a single book. Written in a manner that enables anybody to stick it to memory and follow. Recommend this book to all your friends, young adults, and anybody you care about. It's that important. I found James Altucher's system for becoming an idea machine fantastic and worth the read. The book was funny at times, entertaining most of the time, and full of great advise. This book is very good, but it certainly isn't for everyone. Not everyone wants the life James has created for himself, but everyone can find something helpful from reading this book. Tiene buenas enseñanzas prácticas. Pero personalmente no me gusta tanto el estilo de Altucher. I placed it in the recycling bin after finished, to ensure no one reads it. It gives me a different outlook on things. Happy that I read it...refreshing. I usually follow my gut but not always...I will do it from now on. James Altucher is a writer, successful entrepreneur, chess master, and investor. He has founded over 20 companies and sold some of them for large exits. He has also run venture capital funds, hedge funds, angel funds, and currently sits on the boards of many companies. He has written and been profiled in most major national media publications like the Wall Street Journal, The Financial Times, CNBC, James Altucher is a writer, successful entrepreneur, chess master, and investor. He has written and been profiled in most major national media publications like the Wall Street Journal, The Financial Times, CNBC, Forbes, and Business Week.